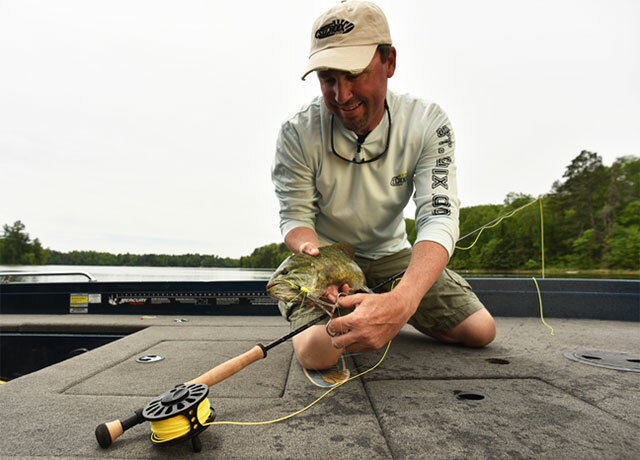 PARK FALLS, Wis. – Bass catching is a pastime of continuously making precision casts. If you’re unable to place your offering where “X” marks the spot every time, all you’re doing is bass fishing. Bass catching with a fly rod can be even more challenging. Beefy balsa poppers and full-sized frogs need to be delivered to tiny openings in lily-pad patches. Substantial streamers and deer hair divers must be sent and retrieved right and tight to weed edges. And bulky crawfish patterns have to flutter and fall faultlessly along targeted chunks of rock and wood. 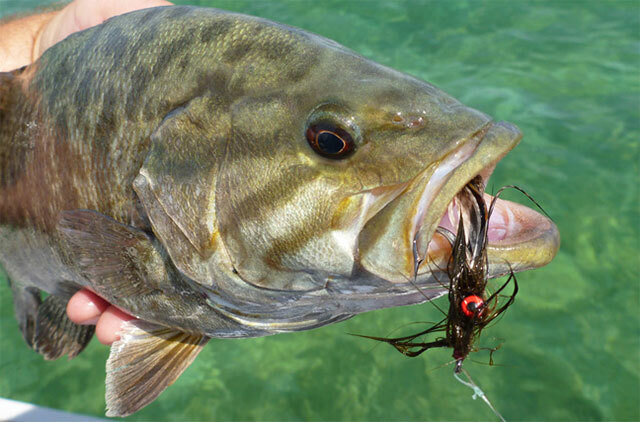 Do it right, and fly fishing is a highly effective – and monstrously fun – way to catch bass. So why do so many avid anglers forgo the flinging of flies in lieu of more conventional bass-casting means? Most likely it’s because they have never made a cast with a fly rod designed with the sole purpose of accurately and easily lobbing the hulking, wet and heavy flies it often takes to fool fish into striking. With this said, let us introduce you to St. Croix’s new Mojo Bass Fly rod. Well, three new rods, to be exact. In the lineup for 2016, these 7-, 8- and 9-weight models are all a tournament-legal 7-feet 11-inches in length and beautifully built for violating the personal space of waiting bass by landing bass bugs right where they need to be. But it’s not just the ease of sending wind-resistant fur and feathers to their mark in a single backcast that makes the Mojo Bass Fly series the fish-catching marvels they are. They also have the oomph needed to make a strip-set and turn a big ‘ol bucketmouth’s head away from thick weeds, or to spin a robust smalljaw out from of a submerged tree. Yet these rods have the perfect action for transmitting the delicate subtleties of the load of the backcast, queuing the angler to swing forward for the ideal cast. “Mojo Bass Fly was designed for making shorter, yet more precise casts,” says Dan Johnston, regional accounts manager for St. Croix Rods. “There’s no need to make many false casts. You just lift, swing back then forward in one smooth stroke and your cast is made. And wherever you aim the tip of the rod is where your fly is going to go. All three models (MBF7117.2, MBF7118.2, MBF7119.2) are built on St. Croix’s lightweight yet sensitive SCII graphite 2-peice blanks—black cherry metallic in color just like their spinning and casting brethren—which gives them a moderate-fast action for the quick, untroubled loading during the cast. Premium-grade cork graces the grip, and reels are snugged securely with uplocking, machined-aluminum reel seats. Fly line slides through the Kigan Master Hand 3D stripper guides with aluminum-oxide rings and black frames, and hard-chrome snake guides and tip-top with ease. And the thread wraps are protected by two coats of Flex Coat slow-cure finish. Mojo Bass Fly rods come with a soft-cloth rod sack, and are protected by a 5-year warranty backed by St. Croix Superstar Service. And all this for only $150. Lift, swing, and deliver spot-on-the-spot accuracy in one smooth shot. Set the hook. Land a lunker. Mojo Bass Fly is serious fly-casting perfection.